But this one seems to be working good now with my existing WiFi dongles. I have TataPhoton plus and try to configure with this new router, initial 3 attempts are failed, i searched in google i did not get clear idea. Later i combined multiple suggestions from multiple sources and got it working, so i thought it will good if i share that to help others. Note: While connecting the cable(you have to connect your pc using ethernet card for initial setup, do not use wifi), do not connect the card in the blue slot! 2. User the "admin" as username and password let it blank. 7. System will restart and you have to wait for 30 to 40 seconds. With the above mentioned method it is very easy to configure Tata photon WiFi router connection. I followed the instruction given above. Can you please let me know what is the model of Docomo you are using ? Sorry to hear that. I am using Tata Photon+ (not 3G), but everybody said 3G also works fine with this configuration. If it says no modem detected, then probably the device may not be recognized or not plugged properly. If you have any other specific settings for your device, please check application which you used to connect from PC. If you have tataPhoton you will have a application namely "Tata Photon+" where you can see the configuration for that specific device. Thank you so much brother.its very easy to configure phton with d-link router. within 2min i completed dis process. Thankm u so much. But can u help in other D-link related problem,it vl b appriciated. My problem is -i have brodband connection n til the date i was using this connection over wifi using D-link DWR-113 router. but after refreshing the router nw its not working, means i m able to connect internet but no internet access. in my laptop all driver softwares are uptodate.then also its not working,i applied all methods given in google like u.but then also not working. but one thing- in dis same router i just configure photon n its working properly. Thank you so much .its very easy to configure phton with d-link router. within 2min i completed dis process. Thankm u so much. Thanks for sharing this information! I could connect my photon almost instantly. Does anyone tried with Micromax 3G dongle. I am planning to buy this router for wi-fi access through 3G dongle. I am using same Dlink DWR-113 model. 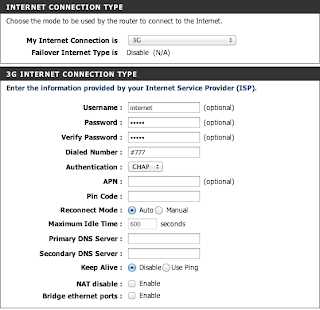 I tried to setup in router, but then router is not able to connect to internt. 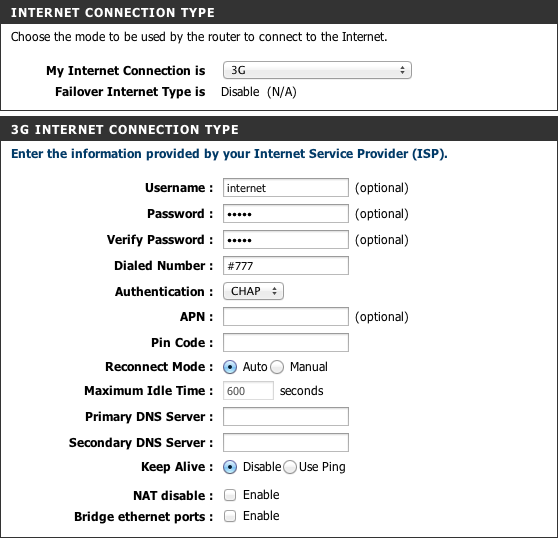 when I use same IP settings (without router) it does connects to internt. @Ajith, Hope this solves your problem. I am planning to buy D-Link DWR-113 3G Wi-Fi Router.Confirmation that this router works with Tata photn 3G would be appreciated. I got stuck at the "connecting..." step because I created my own username/password. Using them exactly as mentioned in the post solved my problem. Hey I have a tata photon max which is wifi donggle with better speed than photon+. I need to use the router with both lan and usb port as I am getting a home automated system installated for which it is mandatory. can you help me to connect Aitel 3g dongle. It works perfectly with just small change. I removed password & dialed number value from the configuration, then rebooted. I am getting 9MBps speed now, perfectly working with 4G using this same router. Its always delighted to read such type of article because it provide lots of technical knowledge so that anyone can sort out his problem by own. We are also playing as a small part for solving router issues @ https://twitter.com/Sarahts01 . 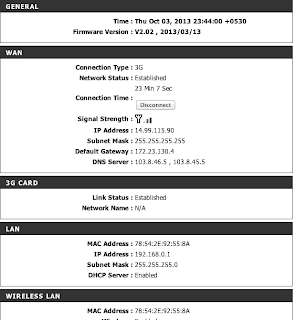 Thanks a tonne for the helpful info.With your write-up configuring my router with tata photon was a cake walk. we are the dealers of rf products ...we have different range of rf antennas...like rf antennas:gsm sticker atenna,pcb antennas ,3g antennas,wifi antenna.and different rf antennas. Can you please help me for photon 3g configuration? @Vijay Patel, Have you tried with the above configuration related to Photon Plus? I am not expert in this area, i just shared my experience, but certainly i can help you if i know the solution. recently I buy "D-Link DWR-111-3G Router ", Wanted to Configure TATA Photon+ (Brown Color Device), I followed the same instruction, Its Not connecting in Status Tab, will really Appreciate if any one can help...Thanks in Advance. I have a D-Link DWR-111-3G Router and an idea 3g net setter. Ibhave tried the manual APN settings for idea as well as automatic APN settings. 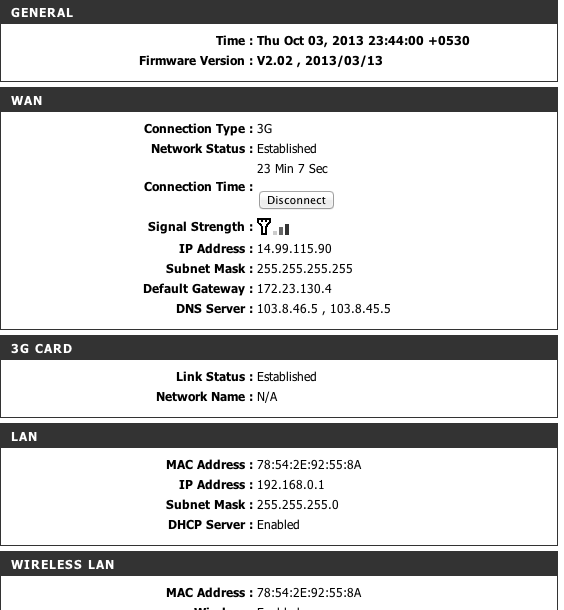 My router status page shows internet online, but I am not getting internet. I checked pinging google.com from the tools page and that failed as well. Another difference I observed from the status screenshot given here is that though it says modem connected, signal strength says "N/A". The modem works fine when connected directly to laptop. I have a D-link DWR 116 , it is not connecting to Tata photon 3g dongle MF190. please help and provide the setting. How do I connect Tata Photon Max+ wifi to my Samsung Note 2 Android phone ?? I do not have a laptop. Thanks. kaps163 at gemale. Advaith 1st day to School All the very best for your fun and creative future dear ! Greatest person in the world!, Yes really! !